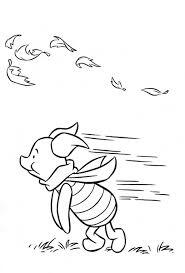 Well when it’s this danged cold, what’s a guy supposed to other than hibernate – right? I mean we haven’t had all that snow like folks up north have but when you wake up and the thermometer says TWELVE degrees and the wind’s blowing, you just know it’s PRETTY COLD. 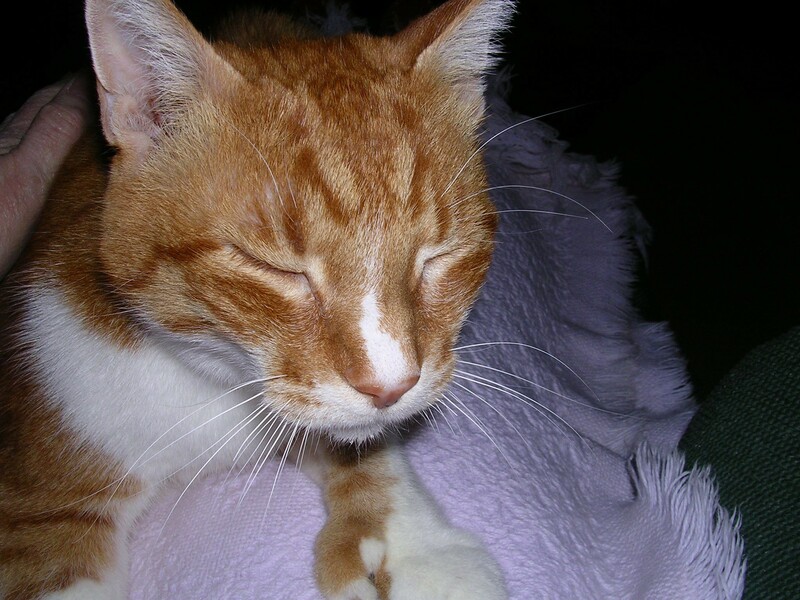 SO, Mom snapped these shots of “this old guy” yesterday………….this is ME doing what I do best…………. I call this the “pre-sleep trance” position….. This is the “If you’d get that danged camera out of my face I’d put my head down and sleep” position! 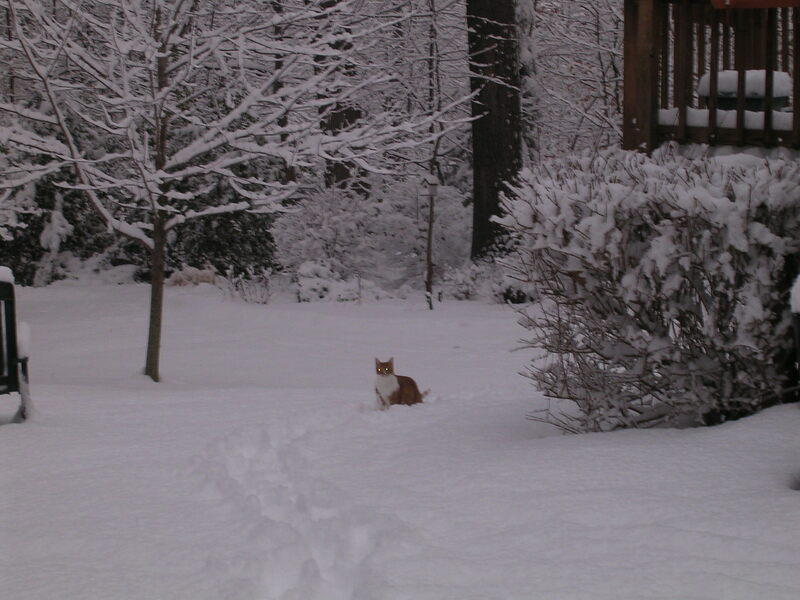 I have no exciting stories of what I did outside when I was out there with Mom because while I have stuck my NOSE out the door a few times, I did not stick the REST of me out there. No way. And to think that in my youth (or at least a few years ago when I was younger than now) I used to do THIS! 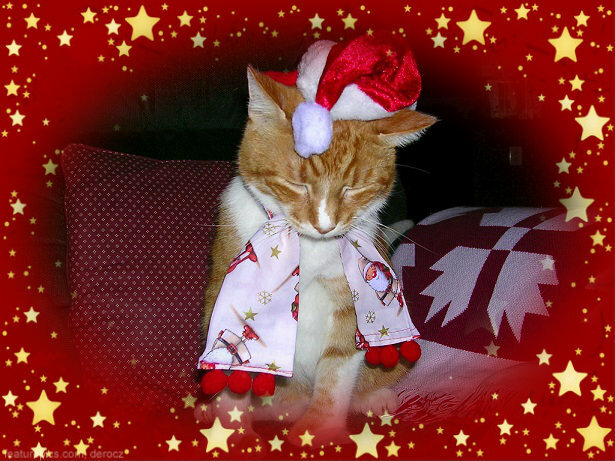 I’ve been saving this for when I redo my blog header after Thanksgiving – because I definitely want to use it in my Holiday blog header……….but I love it SO MUCH I want to show you what my beautiful friend Nellie – Cat From Hell (although I think she’s heavenly) did for me – won’t it look FAB-U-LICIOUS on a Holiday header for my bloggy?????? Thank you Nellie Bellie! All I can do is tell you to STAY WARM…….that’s at the TOP of my personal list of “THINGS TO DO” ! Pee Ess…..I’ve started my Christmas shopping – have you? 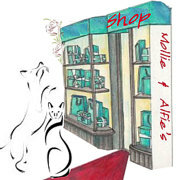 to Mollie’s Shop and SHOP TIL YOU DROP!! 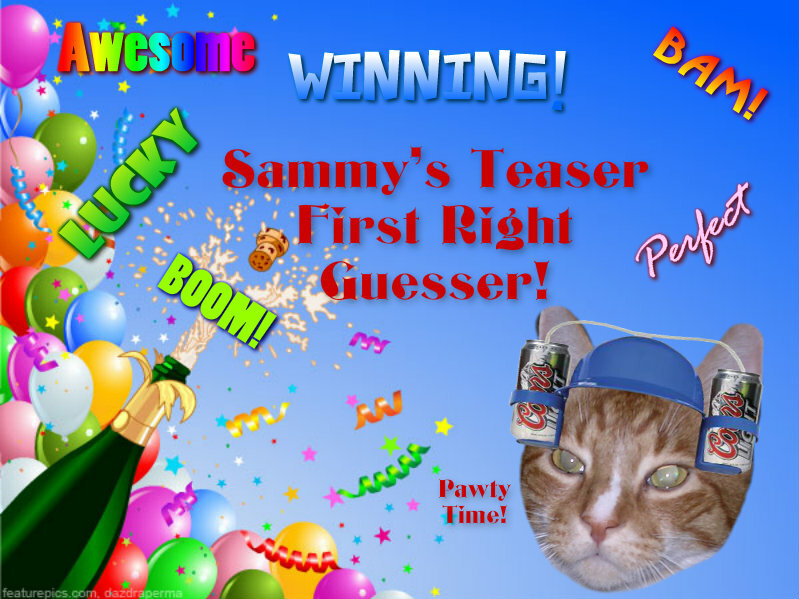 Watch out Easy and Leo……there’s a new Teaser Expert in town (or should I say across the pond) and he’s now been FIRST RIGHT GUESSER for two weeks in a row! Who is it? Stay tuned to find out! Who was the lucky guy who guessed right first? If you remember who won last week then you know it was my friend Flynn from Two Devon Cats! 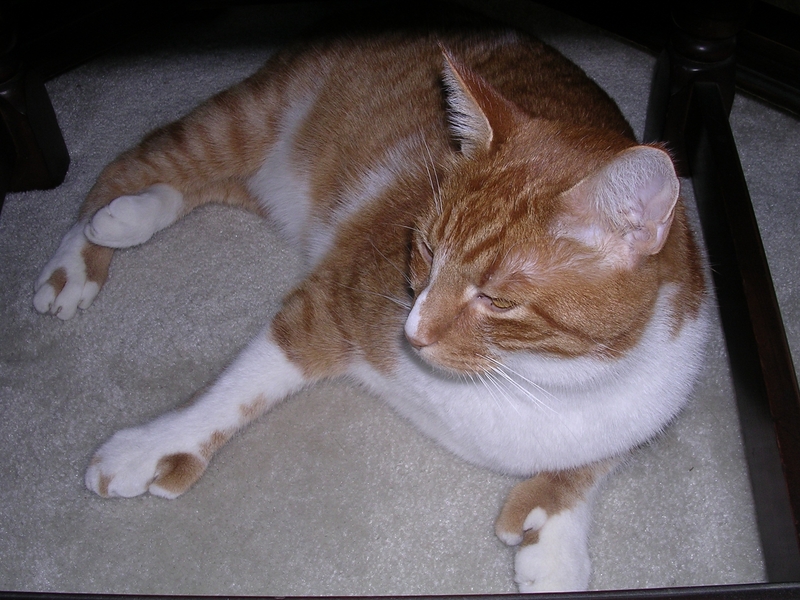 Let’s hear it for Flynn……You may already know that Flynn and I are making the “hyperthyroidism” journey together and I’m also happy to say that we have both had recent checkups and BOTH of us are responding to our medication just fine. Lots more of you guessed correctly too – so of course all of you who did guess right get this! Were you one of the ones who guessed some other planet or place? Or had no idea at all? You STILL win something – THE BIG GREENIE! 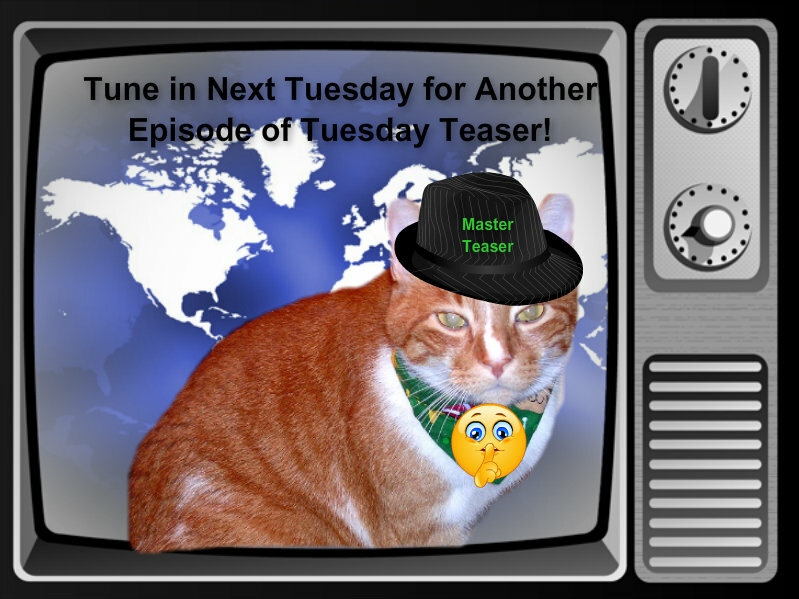 Tune in next week because I will be having a Guest Teaser for you then…………..that’s right………..and it’s a toughie too! Remember that my Mom’s mystery is on sale in Kindle format until the 25th so use the link on the right sidebar and get your HOT COPY soon……………it’s only ninety-nine cents right now on sale – now tell me what else in the world you can buy for that low price these days? Not much!!!! In other exciting news I must say that I was SUPER EXCITED to receive a package the other day from out of the blue – not expected but WOW when I opened it – I saw it was from my buddy Bacon so I knew it just HAD to be good. It was. MY VERY OWN PURRRRSONAL ELF ON THE SHELF!!!! That’s right – you know how every year Bacon and his family are plagued by the antics and troublemaking of his Elf……well now I’m gonna have to keep an eye on MY elf and you’ll be seeing him on my blog from time to time until Christmas. Bacon – I told you what I’d named him but guess what – I changed my mind – his name is now gonna be ELFVIS…..that’s right – as in “ELFVIS HAS LEFT THE BUILDING”…..HAHAHAHAHAHAHA There are always ELFVIS sightings and not all of them are at Graceland. 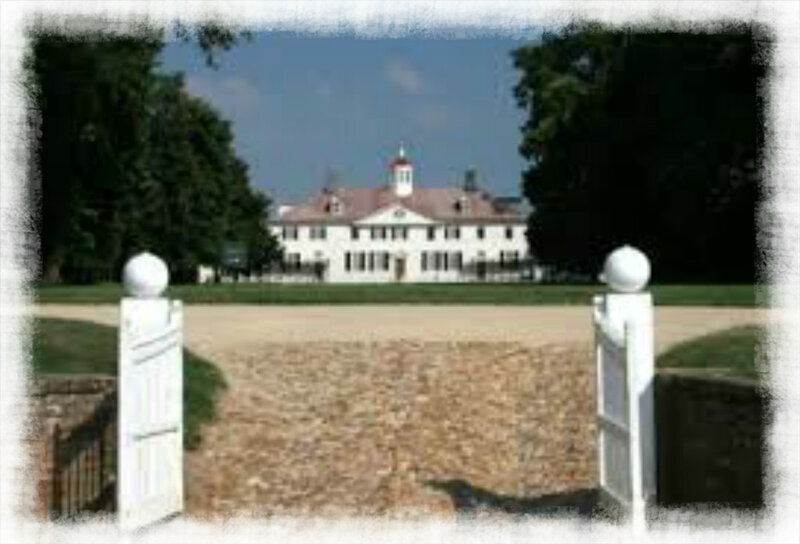 Now there will be sightings right here in Warrenton, Virginia! 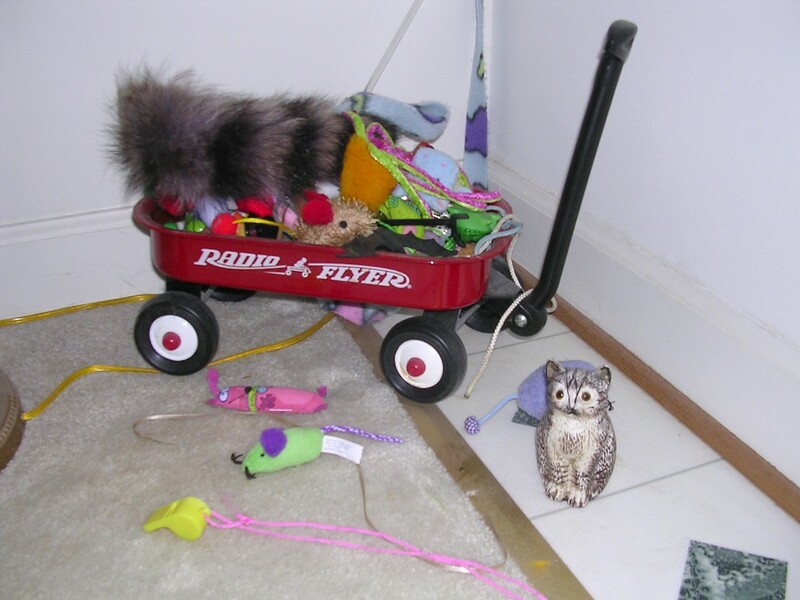 Here are the first two photos I got of him exploring my house……….I can see there’s going to be trouble ahead…………….this guy is lookin’ for trouble with a Capital “T” !!! 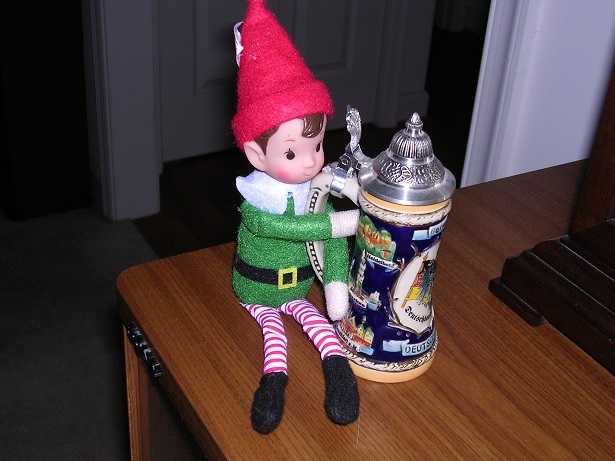 Uhoh….My Dad better keep an eye on his beer stash with this guy around! 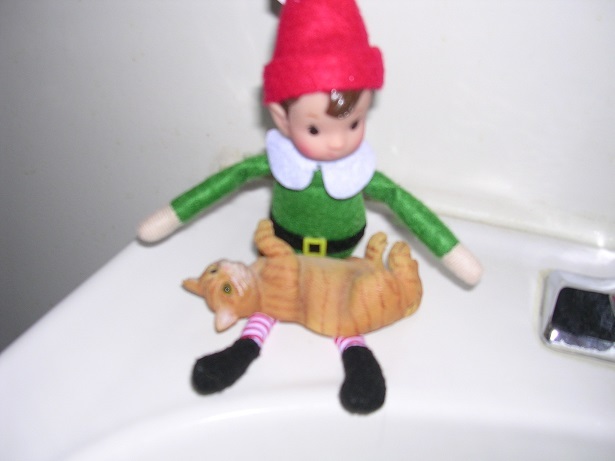 Mom snapped this blurry shot of Elfvis on the bathroom sink – we’re not sure if he was about to toss this kitty sculpture down the sink or toilet….but Mom has moved it out of reach! Thanks again Bacon…..between you and me I’m sure we’ll have our hands/hooves/and paws full of keeping these guys out of trouble around our homes for the holidays. Alrighty then! Here we are on another Tuesday and I think you’re gonna like this one…………….yep – I do……………….in fact, I’m PAWSITIVE that someone will guess this one within the first half hour FOR SURE. See? 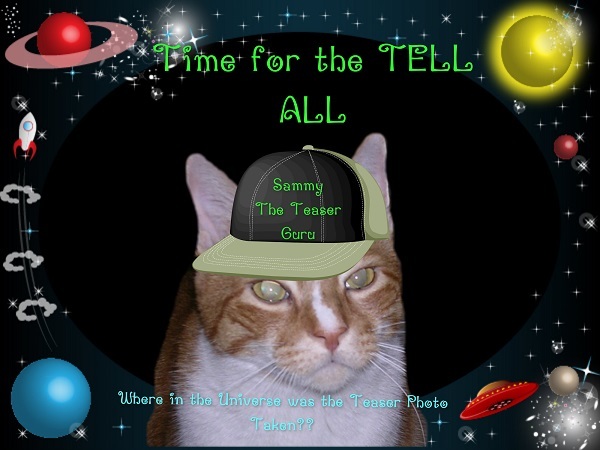 The power of pawsitive thinking at work in the brain of a 14+ year old cat – it’s amazing. So let’s get on with it OK? Ready? Where is this? C’mon, gimme your BEST shot…………………..and if you’re first telling me where this photo was taken, you will be the proud owner of this! If you know and guess right but are not first – you will not be left out in the cold – you still get a reward for knowing! Clueless? Not any idea AT ALL? Or you guess and you are SO SO SO not right? You will win………it’s green but you win it! My team of comment answerers are standing by to respond to your guesses (OK so I lied….it’s just me and Mom and we aren’t sitting here 24/7 to respond instantly so be patient!)! 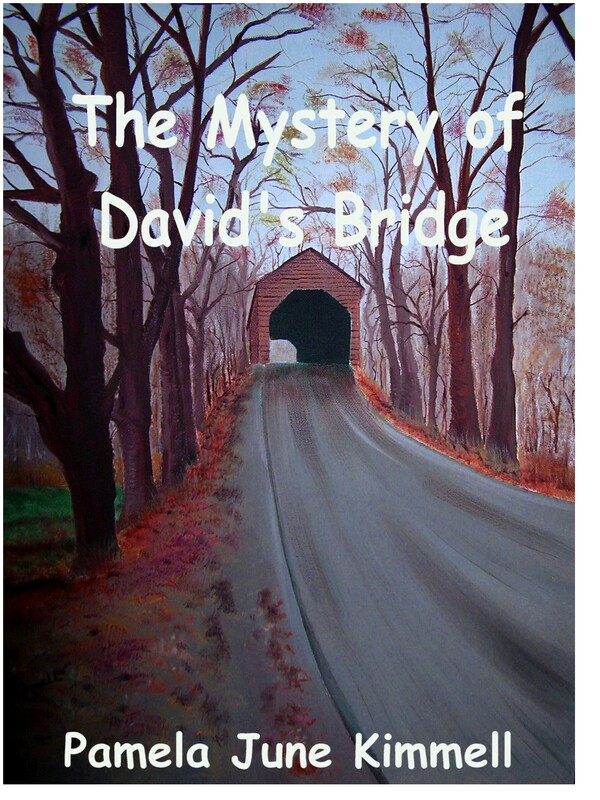 Today is the FIRST day that my Mom’s mystery book “The Mystery of David’s Bridge” goes on sale for a mere ninety-nine cents in the Kindle version. Now that’s a bargin……not only that, it’s a brilliant book so what are you waiting for? 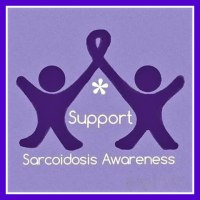 Follow the link that’s right over there (points to the right sidebar on this page) and click for the link to Amazon Kindle. Like mysteries? Like mysteries taking place in small towns? Like mysteries taking place in small towns with a female private investigator? Like mysteries taking place in small towns with a female private investigator who has a CAT????? Good – this is the book for you! 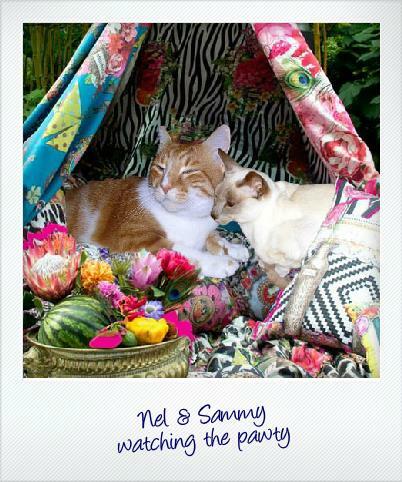 On a serious note…………..today may be the day that my dear and sweet friend Nylablue goes to Summerland (The Bridge). 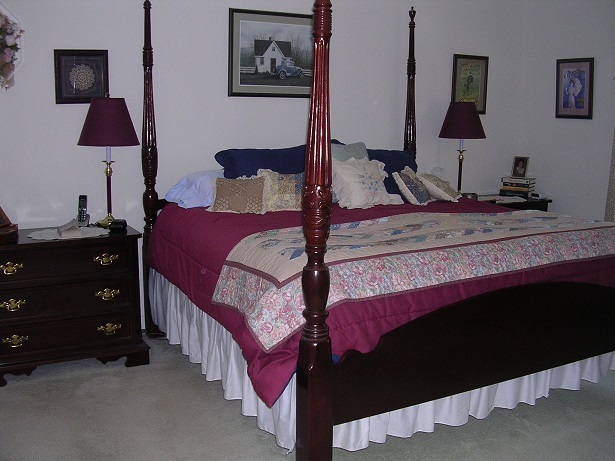 She’s been sick for so very very long………and it seems that the time has come for her to leave her Mom Miss Sherri-Ellen and go off to Summerland where all of us have old friends and family members who left us over the years. 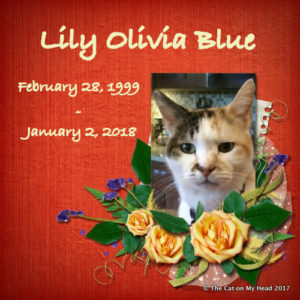 I know they’ll all welcome here with open arms and smiles and Nylablue will be at peace at last. 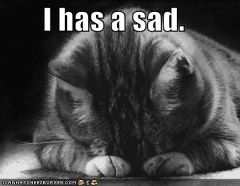 Please stop by her blog and leave words of comfort if you can………………….WE LOVE YOU NYLABLUE and SHERRI-ELLEN……. Hi Everyone! 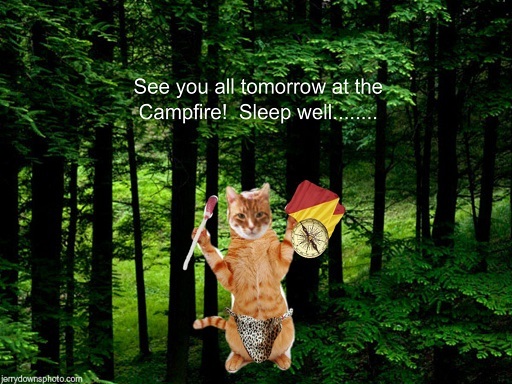 Well the Cat Scouts Jamboree is finally over and I’ve been getting some extra naps in back here at home now……..I needed them. I’m constantly reminded that I am NOT a “Kit Scout” (what we call young cats!) 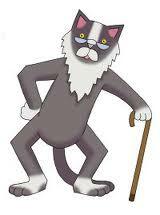 but am a Senior Catizen (haha). Anyway, here’s some info on the last day or two. You know that I had been selected by Denmaster as one of two candidates for “The Order of the Arrowhead” honor……and to receive the honor I would have to spend one night in the Wilderness in a loincloth, with one batch, a blanket, semaphore flags, and a compass. I survived that – and received my beautiful white sash for my uniform as a member of The Order of the Arrowhead. Embarrassed but ready to take the challenge! 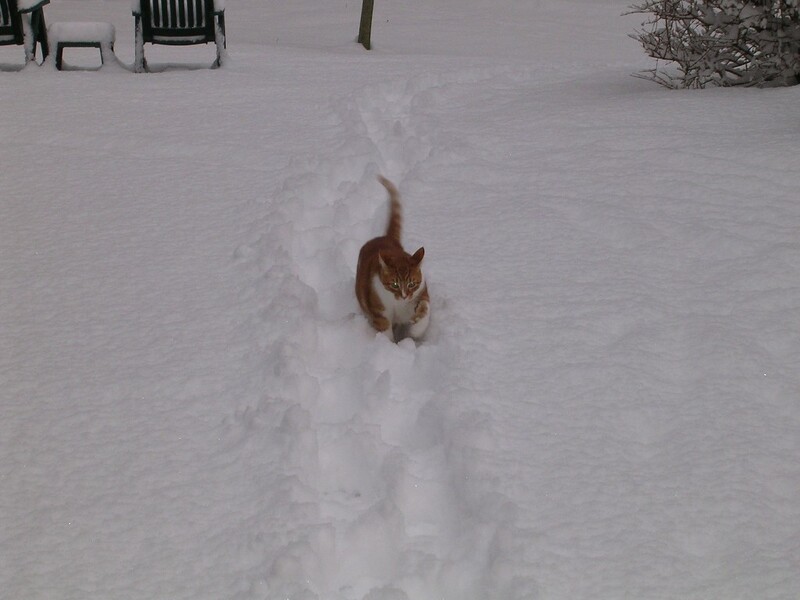 YAY – I made it back after spending the night in the wilderness! The Order of the Arrowhead (OA) recognizes Cat Scouts who best exemplify the Scout Oath and Law in their daily lives. This recognition provides encouragement for others to live these ideals as well. 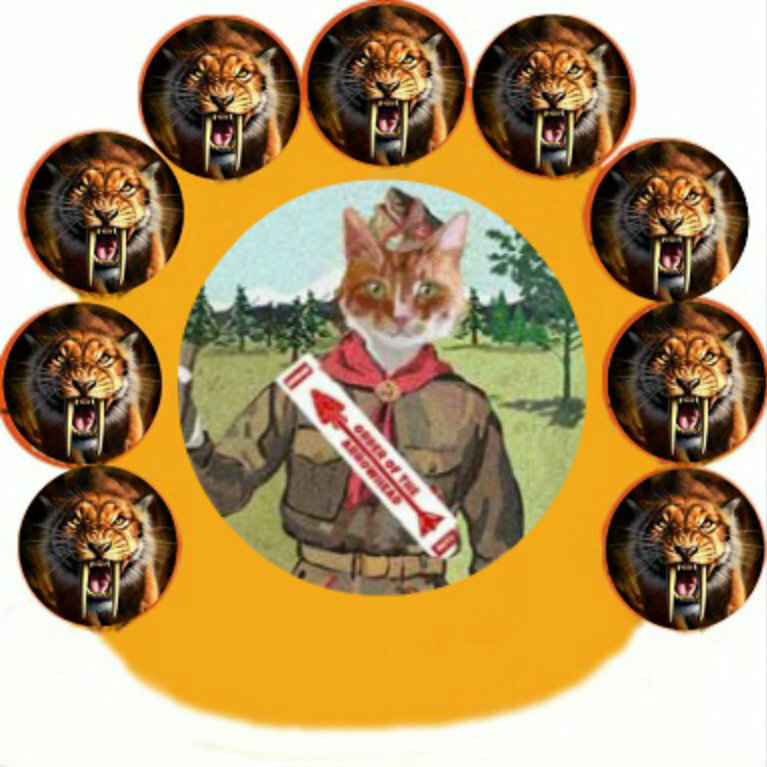 Arrowhead Cats are known for maintaining camping traditions, skills and spirit, and providing cheerful and selfless service to others. The Order of the Arrowhead was originally called The Order of the Naabaawewanwi, the Ojibwe Indian word for arrowhead. Finding Naabaawewanwi too difficult for many scouts to pronouce, we now use the English translation. The tribe name Ojibwe may have originated from their word “ojiibwabwe” meaning “those who cook\roast until it puckers.” Ojibwe are also commonly known as Chippewa. The Ojibwe culture was popularized by “The Song of Hiawatha” by Longfellow. The roots of the skills you learn in Cat Scouting can often be traced to Indian cultures like the Ojibwe. We honor the 566 Federally Recognized Tribes in the U.S.
through the Order of the Arrowhead for their reverence for nature, their ability to live off the land, and their perseverence in the face of adversity. 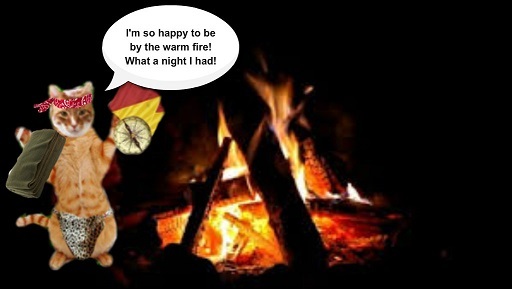 As if that weren’t enough excitement, there was also a promotions ceremony last night – with a LOT of Scouts being bumped up a rank for all their hard work in Scouts…………well, I was SHOCKED when my name was one of five Scouts who was promoted to the highest rank in Cat Scouts………..SABERTOOTH! How cool is that? I was speechless (and that’s a rare occasion for me as you probably have guessed by now). My besties Scouts Raz, Gracie, Mauricio and Nibbler were also promoted to Sabertooth. We’re working on a cool new “avatar” for us to use on Scouts now that we’re Sabertooths and this was my suggestion – what do you think?????? See my beautiful Order of the Arrowhead Sash?????? friends who were also promoted! Here we are this morning getting loaded up into a fleet of hippie buses that Denmaster had arranged for us to use to drive back to Headquarters from the Jamboree Camp. Pretty cool wheels huh?? 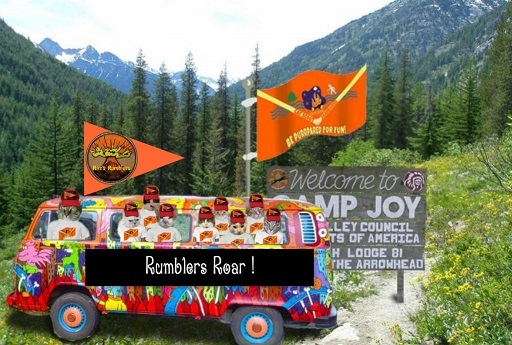 Beep Beep – All aboard Rumblers!! 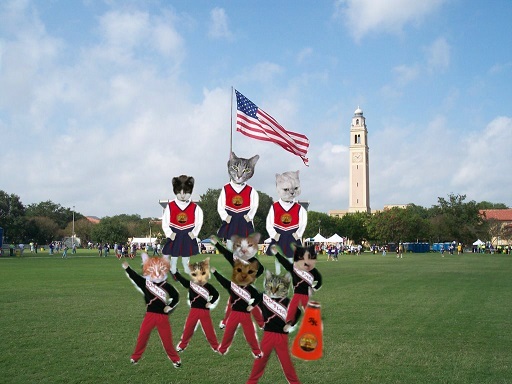 YES we have a blast at Cat Scouts……………….you might think about joining us – just go HERE to find out what you have to do. 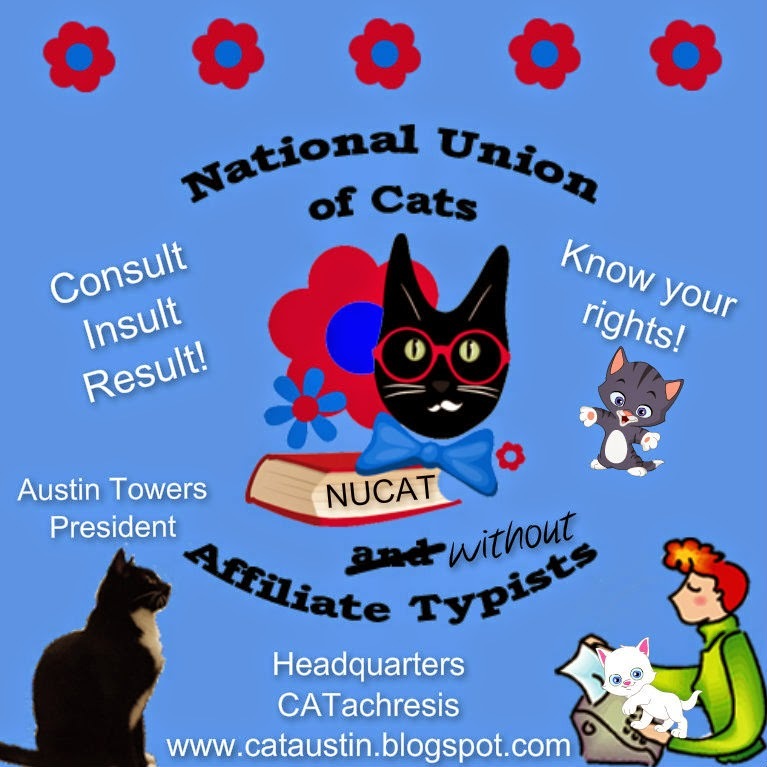 If you DO join up – consider joining my Troop – we are the WORLDWIDE WILDCATS!! 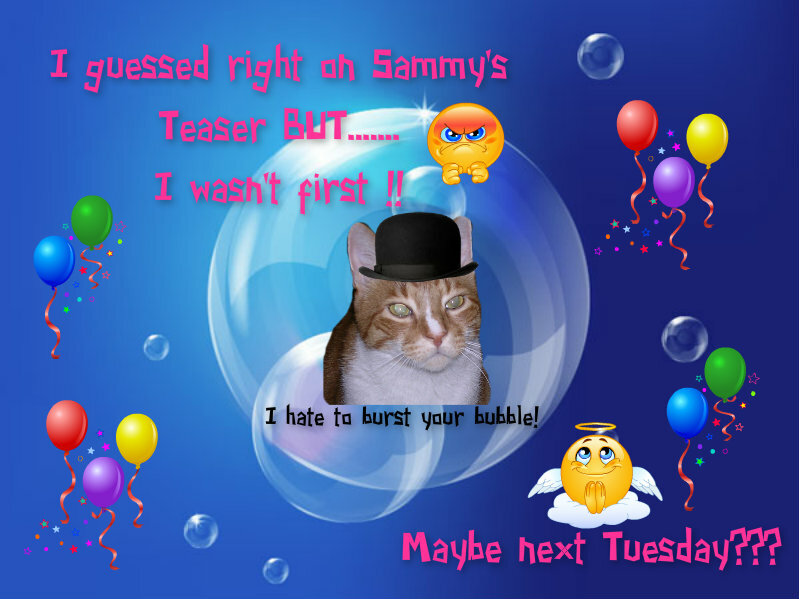 Tomorrow is Tuesday Teaser you know……………….just thought I’d better remind you……………….!!!!! Random time for the post so be on your toes (or paws) !! P.S. Starting tomorrow, November 18th and going through November 25th, my Mom’s mystery novel will again be on sale for NINETY-NINE CENTS in the Kindle version………most of you have read it by now I bet but if you haven’t, and you love a good mystery – consider taking advantage of this FABULOUS deal!!! There’s a link on my HOME page sidebar that will take you RIGHT to Amazon Kindle. WOOT! P.S.S. 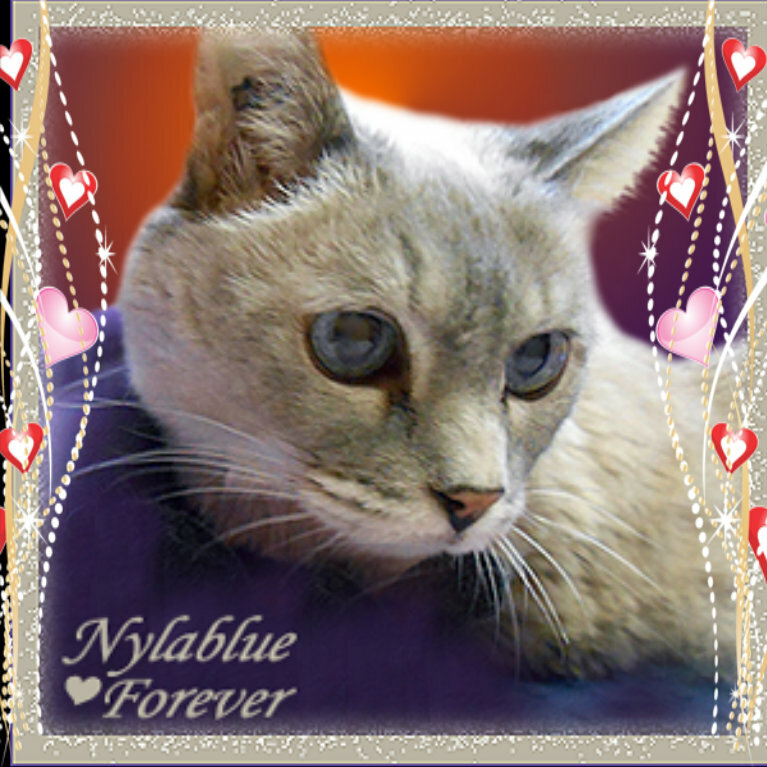 Please send my dear sweet friend Nylablue and her Mum Sherri-Ellen some prayers and purrs…………..tomorrow Nylablue may be taking the trip to Summerland (Rainbow Bridge) due to her multiple medical issues………..we hope her trip is peaceful and full of love…………..
Good grief….and it’s not even Christmas yet! Gosh Mom – was this NECESSARY????? Click above to visit the Blog Hop! Howdy! 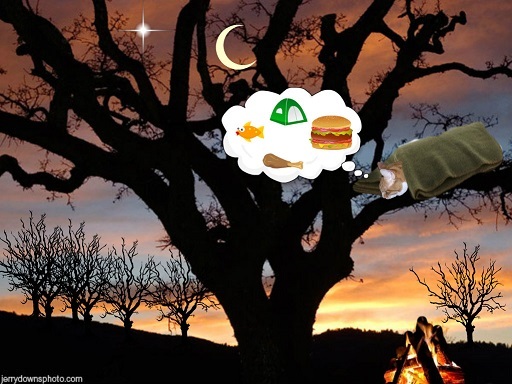 Well, while the Cat Scouts Jamboree isn’t OVER yet, last night was one of the tough nights with a knowledge bowl where we have to really be on TOP of “all things Cat Scouts”……..what can I say? We showed up, we answered the questions, what more can we do??? Right? Right! Tonight we have a Kazoo Band concert (tee hee) and a Promotions ceremony and then tomorrow we FINALLY go home. It’s been a long few days – if you don’t believe me, just ask my Typist (aka Mom)!! 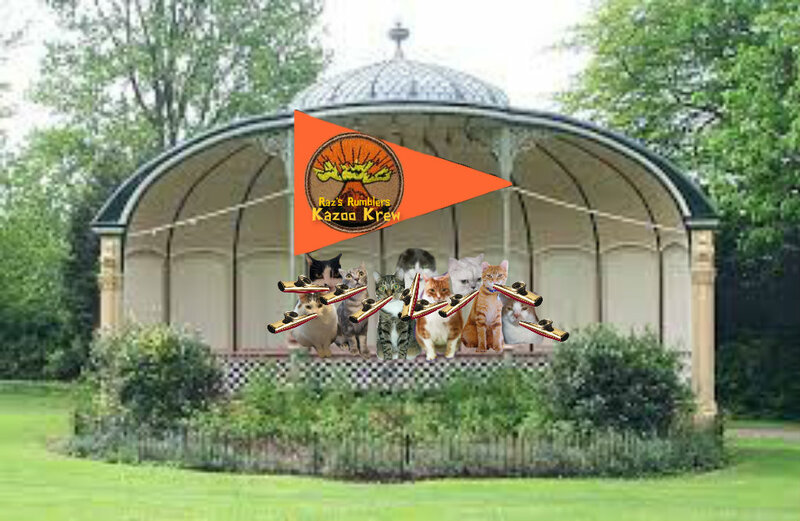 My Patrol’s Kazoo Band practicing for tonight! 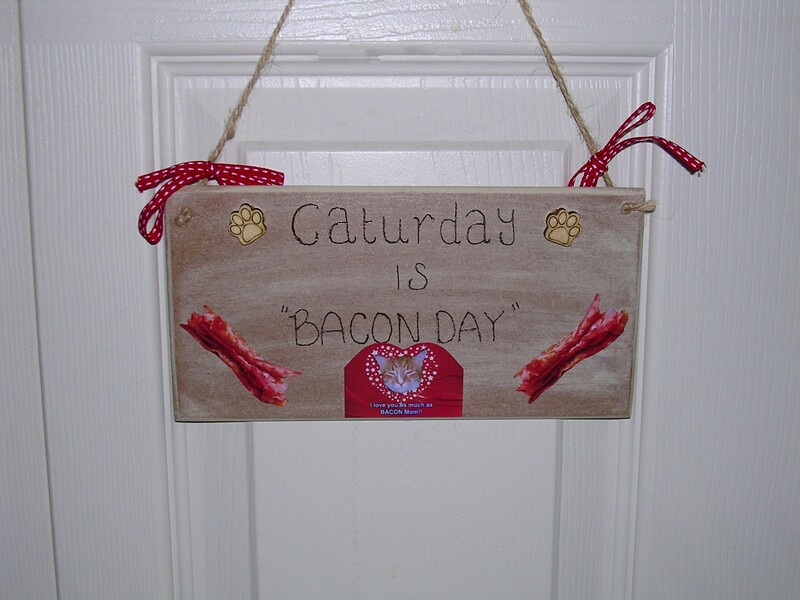 But first things first………….today is BACON SATURDAY…………..I focus all my attention on Mom as she fries up the bacon for our Saturday morning breakfast feast…………..and while I’ll be “washing it down” with my strawberry yogurt chaser with the supposedly hidden medicine in it (hahahahaha), the MAIN EVENT is the bacon. 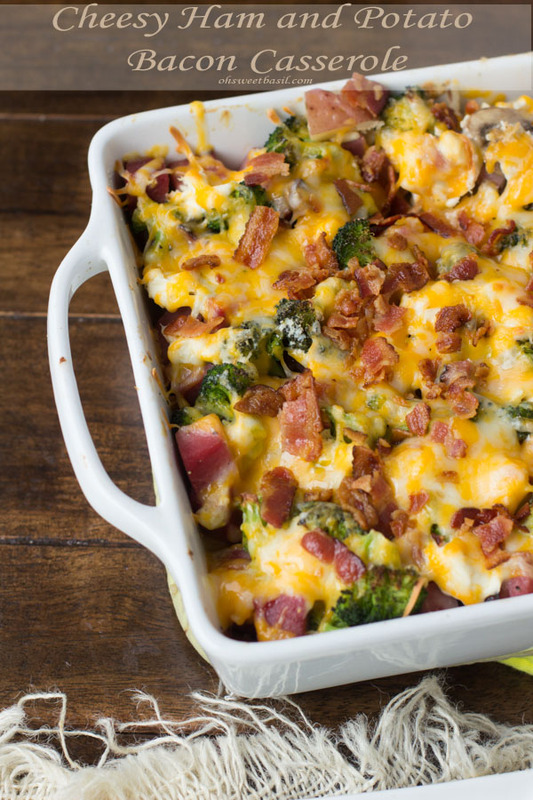 I go on and on and on about bacon but I just KNOW that all of you must have ONE THING – one deliciously fabulous THING – that you feel about like I do about bacon……………so what is it? C’mon – tell me……you know I can keep your secret………….what is your favorite eatable EVER????? Oh yeah……………….FEARLESS – that’s me alright……………….why? Well Wednesday evening at the Cat Scouts Jamboree I was asked if I’d like to complete a special challenge to win a special honor……….being the idiot brave cat that I am, I said SURE! Who knew that my challenge was being given a compass, a blanket, one match, a set of semaphore flags and a (gulp) leopard skin loincloth to wear before I was to head out into the “wilderness” and spend the night as best I could. If I could make it back to the Campfire by yesterday evening (COULD????) then I’d receive a special honor. One other Scout – my friend Nibbler – was also challenged although she got a leopardskin leotard to wear (with slightly more coverage than my loincloth!). And this is how I spent the night out in the Wilderness and my triumphant return to the Campfire last night to TELL MY TALE!!!!! That means I’m officially fearless (right?) 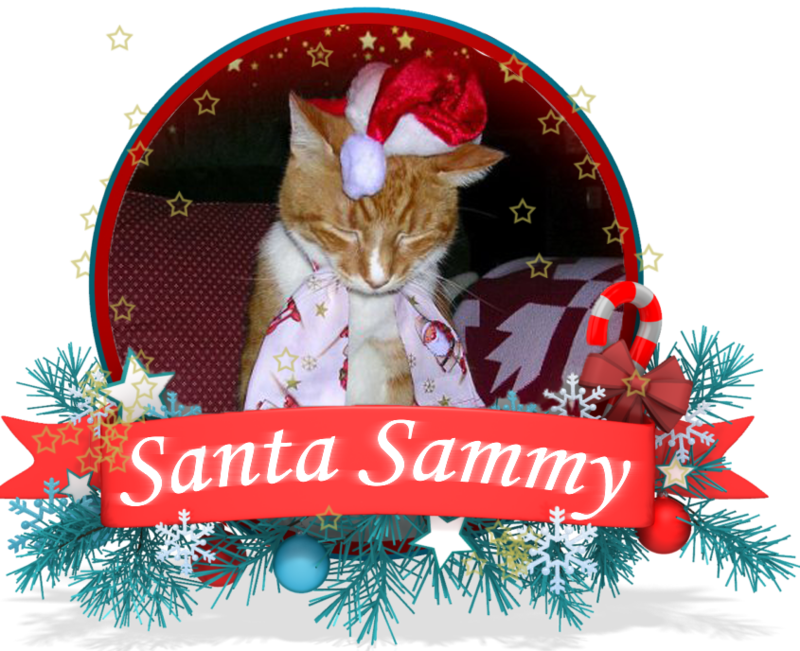 and I’ll get a special white sash to put on my uniform because I was able to complete the challenge…………..I do hope you’re suitably impressed by this fear considering I’m definitely one OLD cat! 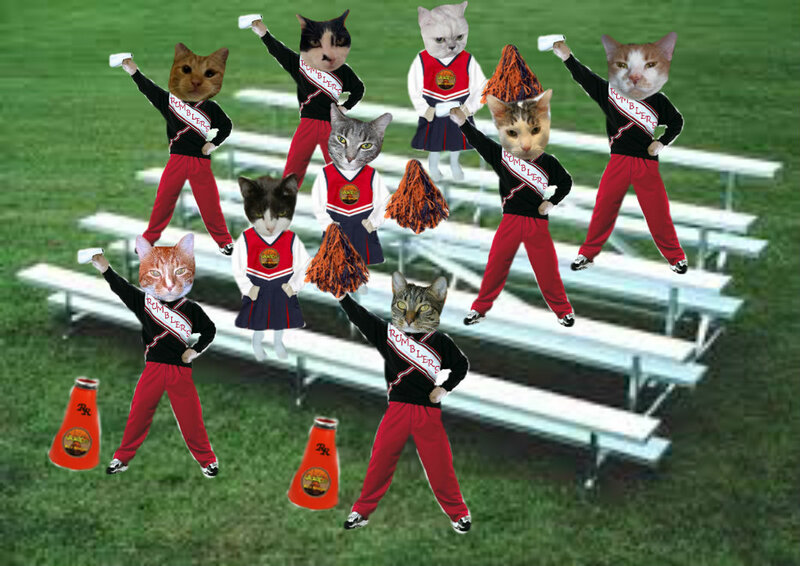 We also had a cheerleading contest (as if I hadn’t just spent the night in nowheresville I had to pawticipate in a cheerleading contest!). 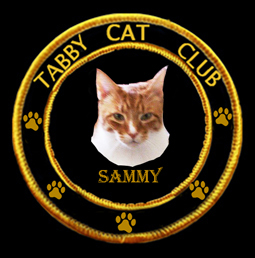 But of course we looked spectacular as a Patrol………………..
Let’s hear it for Fearless Sam! The doc called my Mom to tell us that my blood work showed my thyroid level as NORMAL now – so my medicine is working!! We celebrated last night and I want to tell all of you THANK YOU FROM THE BOTTOM OF MY FURRY GINGER HEART for being so encouraging while I waited for the news. Mom and Dad have been worried about me since I’ve been a bit difficult about taking my pill every day BUT I’m apparently getting enough medicine to get my level down to normal. HUGS TO EVERYONE!!!!!!!!! 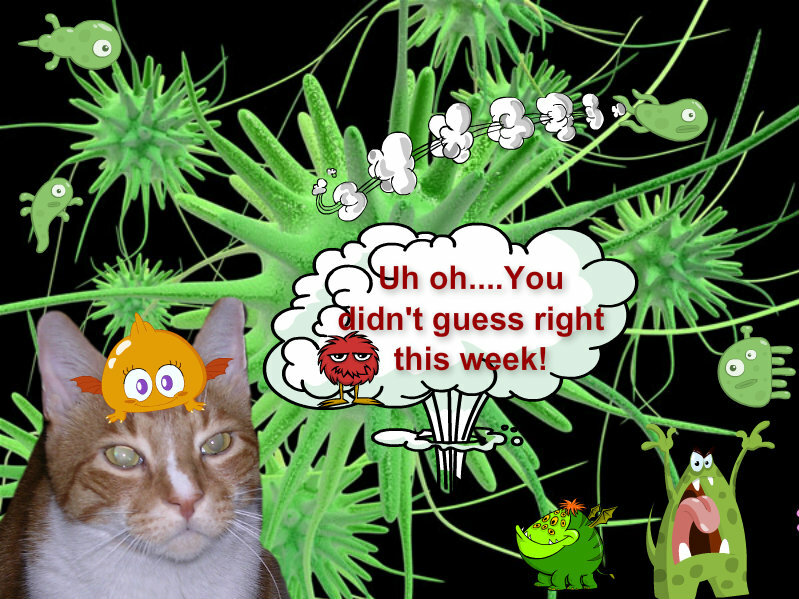 Yep – I know what you’re saying…………everyone else does a “Wordless Wednesday” but I’m changing it up for MYSELF this week because (if you can believe it) I am giving Mom and me a break. I’m just gonna post a couple of photos from the first day of Cat Scouts Jamboree and ask that you give me a break this week! We’re a little distracted here anyway since we’re waiting for blood work info. So, here’s a little peek at what’s happening at the Jamboree! ENJOY! I’ll have more photos for each day of Jamboree (we come home on Sunday)! Where is this? 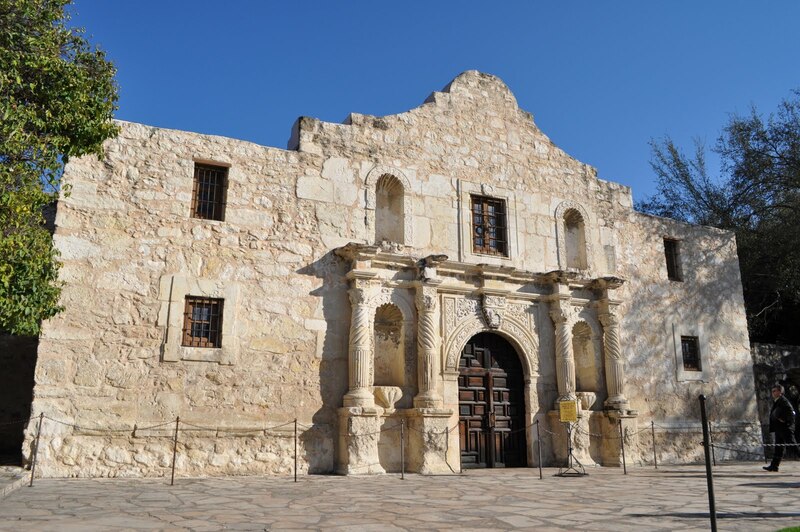 Why it’s THE ALAMO in San Antonio, Texas! That’s right – and know who guessed it FIRST??? My buddy and pal Flynn from Two Devon Cats that’s who! Concatulations Flynn. You get this lovely badge for being the first to guess it was The Alamo. Lots more of you hopped on The Alamo bandwagon though so you all get this! And you know if you had no clue that you still win something……………The BIG GREENIE!!!! I had my vet visit yesterday and while one of my thyroid glands was swollen, my doc wasn’t too overly concerned – they took my bloods and will check things out and call me and Mom Thursday with the results. 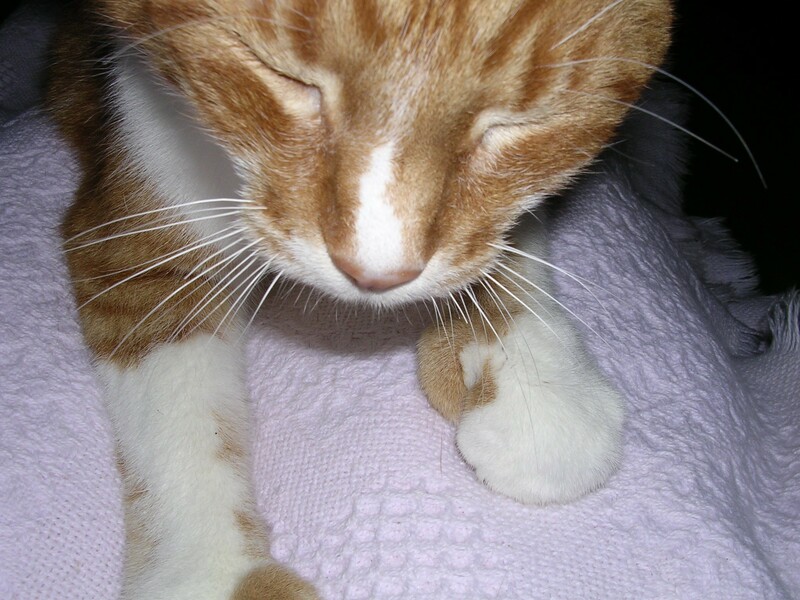 Paws crossed I won’t have to start taking TWO of those disgusting pills every day. 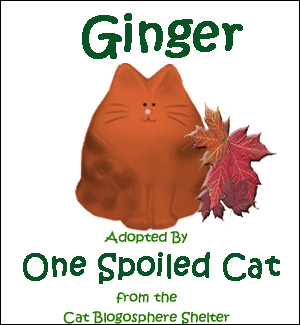 If you have any spare purrs – please send them my way! Until tomorrow – I hope you have a FANTABULOUS Hump Day……………and again – congratulations Flynn ! !